No, that's not the name of a distinguished firm of tax lawyers with a German flavor, and no, Irwin Schiff has not been offered a place in the Obama Cabinet. That would be the day! 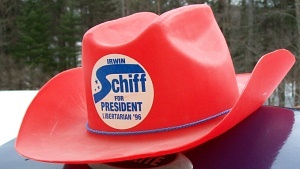 He did once run for President, with a cute little red plastic cowboy hat adorning the heads of his Libertarian Party supporters, but delegates instead nominated Harry Browne, who did a very creditable job. Schiff earlier ran for Sheriff of Clark County, NV, having noted that as that top law-enforcement officer, he could stop all federal searches and seizures in those parts (for example in connection with the alleged income tax) by simply withholding his permission. Voters around Las Vegas were, alas, too dumb to catch on. Why, then, do I place him alongside those three unindicted crooks in my title? Because the four do have one thing in common: all had a bit of trouble with their respective 1040s. Tim Geithner, Nancy Killefer and Tom Daschle each had ample advice about how to complete their tax forms; one of them even used TurboTax. But all three "forgot" to mention some income they later said they received, or got confused, somehow, about expenses and taxes concerning the employment of immigrant household assistants, whether legalized or otherwise. Hey, I understand! We should not blame them too much, the wretched Form is horribly complex, and a mere keystroke error can issue TurboTax the wrong information so that it comes up, naturally, with the wrong result. IRS Commissioner Shirley Peterson, no less, once said, "Eight decades of amendments and accretions to the Code have produced a virtually impenetrable maze. The rules are unintelligible to most citizens--including those who hold advanced degrees and including many who specialize in tax law. The rules are equally mysterious to many government employees who are charged with administering and enforcing the law. "It is also a known fact that the Internal Revenue Code is a very easily misunderstood area of law, even misunderstood by trained professionals. Judges and lawyers admittedly do not know the tax laws." That was 16 years ago. Nothing has changed. "Judges and lawyers admittedly do not know the tax laws." Geithner, Kelleher and Daschle--hereinafter GK&D--are senior government people who do not even claim to know the tax laws, but all presumably accepted the conventional view that the Income Tax has been enacted into law in a manner intended to rip money off what ordinary people earn: salaries, wages, no-charge limo services, etc. Schiff, in contrast, has read the law a great deal, even to the extent of publishing his findings, as in The Great Income Tax Hoax, now available here free of charge, and he takes the opposite view that, while carefully phrased to give the impression of such a tax, for good reasons it actually imposes no such thing. GK&D accordingly filled out a 1040 each year but wrote on each certain numerical inexactitudes, while Schiff declined to volunteer any such information--or else filed one and roundly declared his income to be zero, just because the Supreme Court said that for these purposes "income" means "corporate profit"--of which he had none. The government did not agree, and that is what the four have in common. The big difference comes in how that difference of opinion was resolved. GK&D had each been offered a Cabinet position, complete with all the perquisites and handsome salaries, and although K&D declined after these tax misunderstandings came to light, Geithner accepted. He is now Treasury Secretary, the IRS Commissioner's boss, so would be in a good position to scuttle any prosecution for lying on his tax returns even if his boss, Obama in person, had not already absolved him with a quick "Anybody can make mistakes." Such absolution, however, did not come the way of Irwin Schiff; even though his mistake (if any) was every bit as understandable given Commissioner Peterson's opinion. He was instead given 13 years. If he doesn't die first, he will emerge from his government cage when he is 88. You might agree that a double standard is at work here. When his next book is published later this year with a blow-by-blow account of how that trick was pulled, your agreement may be even more fervent. I recently watched a 5-minute 2008 video of Harry Reid, now Leader of the US Senate, being interviewed about whether it was appropriate to forcibly transfer money from taxpayers to welfare and other beneficiaries. To my astonishment, and I think to the interviewer's, the Senator repeatedly denied that taxation in this country is "forced" at all; he said it was voluntary. He seemed quite confused about his reasons, but his conclusion is right next door to Schiff's. His address is not. So what's an ordinary mortal, not in-line for a Cabinet appointment, to do next April 15th? Hold one's nose, swear a false oath and send in the miserable Form while withholding such expensive information as one thinks the government is unlikely to detect? That's what 140 million will probably do. The false oath comes in its last line; the filer has to swear he believes that the foregoing is true, and will normally have made some entry on some of the lines in the paragraph headed "income." Schiff still insists that in the context of tax law, that term means "corporate profit," because the Supreme Court said so; but on that point I cannot agree. My reason is that, like Congress and the President, the Supreme or any other court has no power at all to amend the Constitution--that is granted only to the States (supposing for the moment that the Constitution has any validity anyway). Since the "income tax Amendment"--number 16--uses the term "income" but fails to define it, for anyone to make such a definition would be for him to try to amend the Constitution. Not allowed; hence the meaning is forever (or until the States vote on a new Amendment) profoundly obscure. So how can an honest person swear he believes it includes or does not include this or that receipt of money? Therefore, it's not just GK&D. Government has made liars of us all. Except Schiff; and him, it has made a prisoner.